A lot of RUST players have been asking Malonik about how to handle wipe days in RUST. So he’s put together a great video all about dealing with wipe day as a solo player. His solo method can still be utilized by larger groups, but things will move along considerably faster. Be sure to browse Malonik’s past videos and don’t forget to subscribe to his channel to receive notifications on his latest videos. 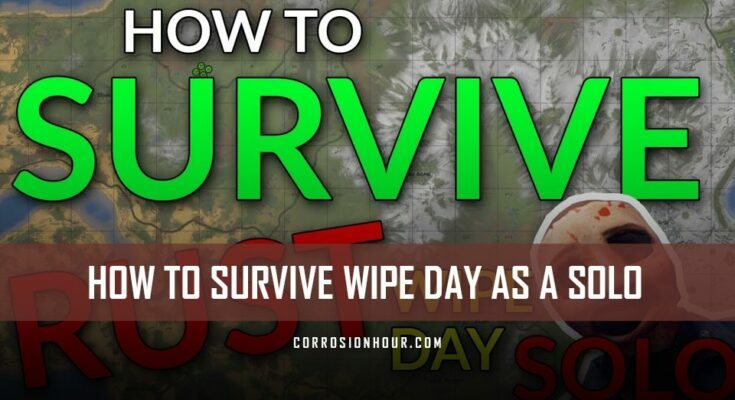 Hey guys, mal here and today we’re going to take a look at what to do on wipe day as a solo player. Firstly, take some time to look at the map before you actually start doing anything. It doesn’t matter if you get killed a few times by other players on the beach. Find somewhere that works for your playstyle, if you like heavy pvp set up on a road near a big monument, the dome is usually pretty good for this. If you prefer a more sneaky approach find somewhere that is out of the way however you’re still going to want to have a nearby road and a few small monuments as it’s crucial that you start farming up scrap and looking for items to research. Keep in-mind that the sooner you are on at the start of a wipe the better. You want to be progressing with the others rather than having to try and fight them with a bow while they’ve already moved onto early game guns. Once you know where you want to set up it’s time to craft up some of the basics to protect yourself while you get to the area you’re after and farm up some resources to get a little base down. Craft a bow and arrows. Lastly craft a wooden helmet to stop getting 1 tapped in the head. Make your way over to where you want to build, farm up the resources for a little 2×2 wood or stone base, ideally, you’re aiming for stone however wood will cut it for now. This is about speed at this point so don’t go too far out of your way while looking for stone. Having a wooden base is far better than getting jumped with all the resources for one. On your way over you want to grab any cloth you see and if you wander past a road or power line check around for red barrels. You don’t want to spend too much time on the roads yet as everyone will be hitting them, but red barrels always have low grade in them and that is extremely important right now. Additionally, take into consideration the environment that you’re planning to build in. For example, if you’re going to build in the desert then you’re better off farming trees somewhere prior to hitting the desert given that the trees there can be few and far between. If you do end up with some of the basic resources along the way start putting them to good use. You’re going to need a building plan and hammer to build your base. Additionally, you’ll need a tool cupboard, sleeping bag, two doors, 3 key locks, a small box or two, and a campfire. I know that sounds excessive but the more you can have ready to go by the time you hit where you want to build the better your chances are of getting established. On popular servers you have got to move fast if you don’t want someone trying to jump you while you’re sitting there waiting for a door to craft. If you’ve got an excess of cloth make an extra sleeping bag or two. Throw one down in a bush every once in a while, and name them by the grid you’re in on the map. These will get taken out by other players but for right now while you’re just trying to get to where you want to build they’ll be far more reliable than random respawning. Once you get to your build location throw down a basic two by two, make sure when you plan it out you have room for triangle foundations around the outside of the 2×2. If you don’t leave it and rebuild or destroy it and start again. This is extremely important for properly securing your starter base later down the track. Your goal is to get a basic 2×2 down in stone with a metal door asap so that you can’t be eoka or flame raided as both of those raiding methods will be starting up over the next few hours. Use the first foundation through the front door as an airlock. I know it’s not the usual front triangle airlock but that’s okay, we will be incorporating it later. In order to craft that metal door, you’re going to need a furnace which is 200 stone, 100 wood and 50 low grade fuel or alternatively 39 animal fat and 13 cloth to craft the fuel. Make sure you have key locks on your doors and cupboard, you don’t need to create a key, instead just lock them. You’re the person that put the lock down so when you lock it you don’t need a key to get in and out. If you were playing with multiple people your next goal at this point would be to get code locks down instead of key locks so everyone can get in and out of the base on their own. Next we’re going to set up a loot room here with a double door. Drop any resources you’ve got off and don’t forget you can use the tool cupboard to store a lot of resources and it is way tougher than a box. After that we need to get a research table and a level 1 workbench down. Head to the nearest road and clear out all of the barrels and boxes while you head to a small monument. Dump all of the components you find into the recycler, make sure you clear the area first and once you’ve made sure nobody is around start recycling. Keep an eye out as best you can so you don’t get jumped as easily. Also, be careful when you’re looting roads as the scientists do not appreciate your company. A research table will cost you 200 metal frags and 75 scrap however you need the level 1 workbench in order to craft it which costs 500 wood, 100 metal frags and 50 scrap. So if we total those two up we get 500 wood, 300 metal frags and 125 scrap to get them down in the base. Given you’re just solo and it’s a starter 2×2 for the time being just keep the research table in a box somewhere. Then whenever you need it put it down somewhere, use it and then pick it up with a hammer in your hand and put it away. I realize that in doing that there’s a chance someone will steal it if they raid you however it’s cheap enough that i personally don’t worry about it and would rather the extra space for more functionality in the base. Plus, if you’re getting raided you can throw it down to block a door and buy yourself a bit more time. The next step is to get back out there and keep farming. You want to hit as many barrels and boxes as you can for the best chance to find items, guns and equipment to research as well as components to recycle for scrap. The goal here being to farm and research as much as possible before you get raided. Additionally, you’re farming high traffic areas, so you’ll get your fair share of pvp and if you’re lucky a bunch of extra resources. Yes, your little 2×2 may get raided but the cost that has gone into it is minimal and it’s easy to rebuild elsewhere if that happens. If you’re prepared to farm up some of the basic resources, then we can look at fortifying and upgrading this little base. The key rule to a base in rust is to make it look like it’s more effort than it’s worth. If you can do that you’ll drastically reduce your chances of being raided. Personally, I like to farm up a good bit of wood, stone and metal so that if I decide to upgrade the base I can do so quickly. That being said when upgrading do not take all of your resources out at once. Take a chunk of them out, upgrade, go back in and get more. Just in-case someone sneaks up on you and jumps you while you’re building. Now remember how we added triangle foundations around the outside of our 2×2? We’re going to use it as honeycombing for the base as well as making a few entrances into your base and even a few fake entrances. How crazy you want to go with this is up to you. Remember your goal is to make this place look like more of a pain in the #$$ to raid than it is worth. The end result should at the very least be that your entire base including the roof has honeycombing. As you’ll see here I’m adding doors and doorways around as much of the outside as I can. The hope being that if they try and door raid the base then they would have a 1 in 4 chance of getting it right. The other options are a waste of time and booms. To help misdirect people that are nearby your base or watching you go in you can jump into the wrong door, wait a few minutes and then head out and into the real entrance or once you have drop boxes set them up so you drop items into the base then f1 kill to respawn inside. Now with the roof I’m a big fan of double stacking. Yes I know you could use that space but your current goal for the wipe is to farm scrap and blueprints. You don’t need more space than what you already have in your 2×2 and if you think you do then you’re hoarding too much @$%#. So build up and get onto your roof. Add two half levels ensuring that you’re upgrading it and sealing it up as you go. Make sure that at the very least you make the center 4 square ceiling tiles metal. With the honeycombing the walls over the core 2×2 are incredibly important. It’s up to you whether you go with stone or metal. It will push your costs up using metal but it’s a lot more sturdy so again it’s up to you, personally i go for metal. The reason that we’re adding walls here is because if someone is raiding through your roof without these walls the raider will be able to take out the entire ceiling of the base at once with rockets making it a cheaper raid. These walls mean that they have to decide which ceiling tile to go into and it significantly slow down the raiders and cost them a lot more booms to get everything in your base. Once you’ve done that we’re going to add one more deterrent for potential raiders. On the core 2×2 of the roof add the slanted roofing inwards like this. If you add it to all 8 sides it closes it in nicely and gives the raiders another layer to go through. Placement for these can be tricky as placing all of them essentially traps you inside it. I’d recommend placing and upgrading all but one of them. Then head back in your base and dump everything apart from a building plan, hammer, a little wood and a little stone. Back up and in you go, build it, upgrade it and then f1 kill and respawn inside. Don’t forget to get rid of the build up you put down initially to get on the roof. You’ll notice that from the outside it now looks like you have a 2 floor 2×2 and that’s exactly what we want raiders to think. We want them to see all the doors and decide it would be better to raid from the roof and then hit the 4 layers that they have to get through in order to get in. This should keep you safe from most people for the first few days of wipe. Hell I’ve even had wipes where I have just lived out of this and it was never raided. Now that you have your base fully covered by honeycombing upgrade the entire interior of your 2×2 core to metal for that extra bit of protection. You can arrange the interior however you like though this is my personal preference. Also if the 5 large boxes in your loot room isn’t enough you can throw more boxes down around the place. You get more storage however it does make moving around your base more annoying. Lastly once you get the shotgun trap blueprint you’ll want to fill as much of your base as possible with them. Try and put them on hard to peek corners for example in the loot room. Now it’s time to farm, hit the roads and continue farming barrels and boxes. Recycle any of the components that you find. When you find items to research such as metal tools, a revolver, waterpipe shotgun, double barrel and so on get it back to your base and learn it asap. Farm the little bits that you need for the base upkeep and to make tools, weapons, meds, etc. But focus mainly on researching as much as you can. Once you’ve got enough rad protection hit the bigger monuments. If you find keycards and fuses start doing the monument puzzles which I have a guide for in my videos. If you are having terrible luck and can’t find anything to research you can always hit up the outpost. There are a number of vending machines here selling items and resources for scrap. Here is the pricing from across all of the vending machines. Additionally it’s a safe zone for trading whereby if anyone pulls a weapon they’re dead in a few seconds and even if they do kill you they can’t loot your body, only you can. The brand new bandit camp is also a great place to get some of the items you’re missing or guns if you’re struggling. Here are the prices and items that you can get from the bandit camp. I have another video in the works that will really explore the bandit camp properly however I wanted to still point it out in this video as it is relevant. Lastly I just want to warn you. If you are new to rust or haven’t been around for a wipe day yet. It’s a very different rust experience than playing later in the wipe. To put it bluntly – that #$%@ is [email protected]#=$# crazy. Be prepared for an all out #^%$ fight as people race to get started. Well that’s all from me this time, just quickly I want to thank each and every one one of you for your ongoing support of the channel. I am so glad you guys are enjoying my content. Also i haven’t forgotten about the 1k subs special event. There’s just tons of work that needs to be done to set these things up properly for the experience we want everyone to have. I should have a video in the near future with details on the event and there will be plenty of time to sign up for the event so people don’t miss out. To ensure you don’t miss out on this event make sure you’re subscribed to my channel and click the little bell so it notifies you whenever I release a video. Also get involved on my discord for some behind the scenes action. Whenever I’m sussing out ideas I run them past people on there and if I need extra people in videos I ask in there. Jump on, say hey and hang out. Thanks for watching guys and I’ll see you all in the next video!